First off, I went by myself because of a couple reasons. 1) I didn’t think it would take that long. 2) I knew none of my friends were going to get up early to go with me. 3) I was slightly embarrassed that I was actually going to go be a part of this so-called “art installation”. I managed to make friends with the people who were standing in line in front of me. They were awesome guys and thank heavens we all started talking…the 5 hour wait we endured together would have been literal hell had we not been playing fun games the whole time! 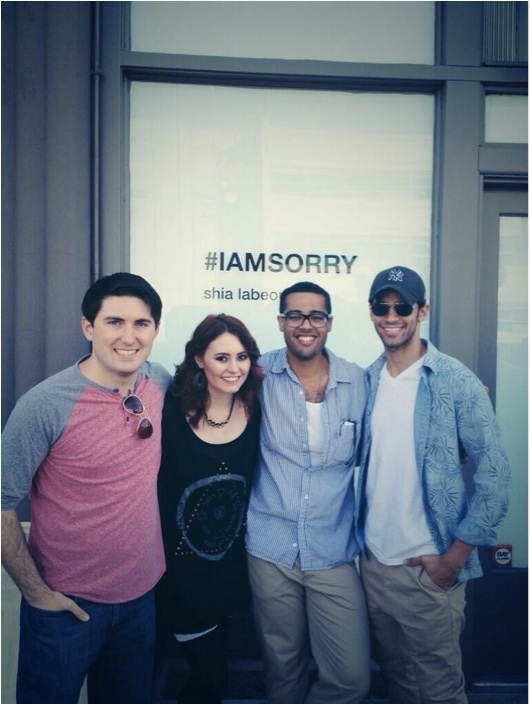 Des, Joe, and Ben….if you’re reading this: y’all are the greatest…”liners” for life! But let’s get to the good stuff. 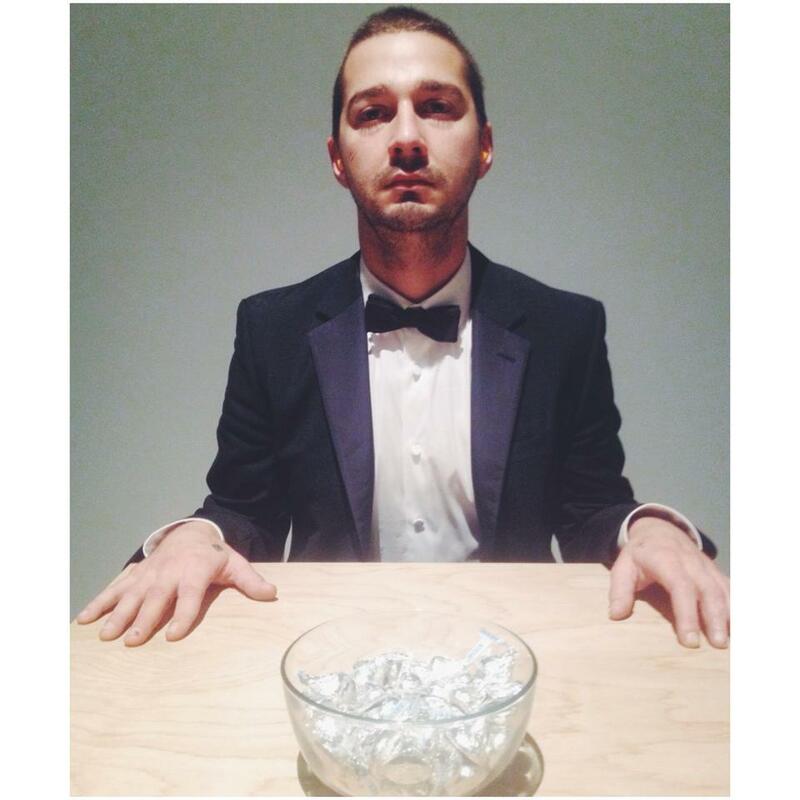 After about 3 hours of baking in the sun, something strange started happening at the gallery next to where Shia’s art installation was being held. We noticed that there was a man taking people from Shia’s line and putting them in a line for the other gallery…saying that “it’s another room, still a part of Shia’s installation and you can go back in line for Shia after”. Well, some people followed him, but my group and I knew something was up. 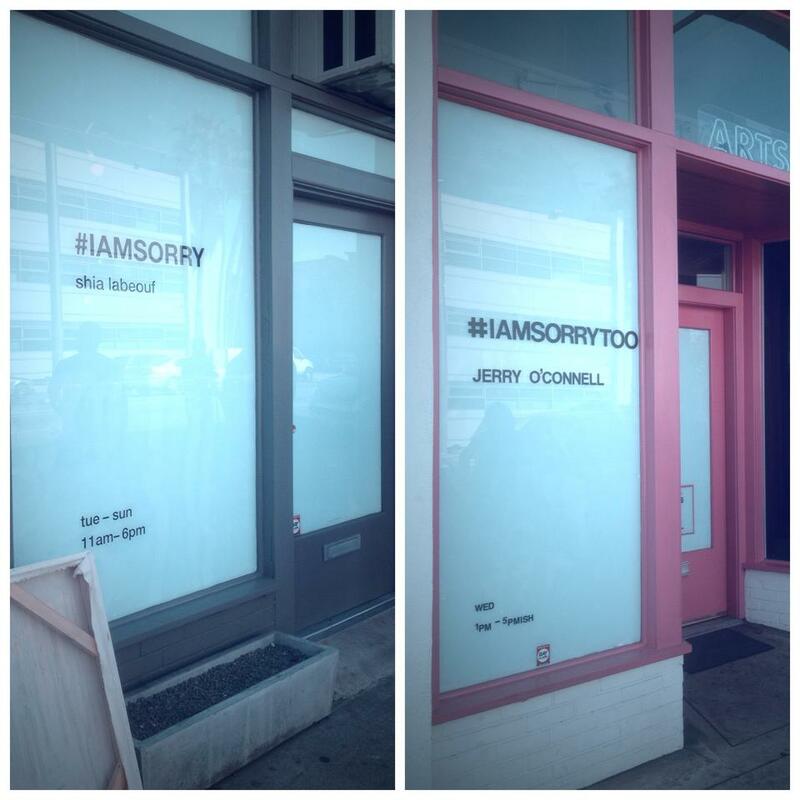 Sure enough, I went over to see what was exactly happening and discovered that Jerry O’Connell was doing a parody of Shia’s art installation named nothing other than #IAMSORRYTOO. Jerry’s “art” was more of a mocking thing than anything else….however, it did lighten the mood a bit. And I have to give him props for coming up with that idea so fast! Unlike Shia’s exhibit, you could go into Jerry’s with multiple people. Apparently, he was sitting down with a paper bag over his head (like Shia) and jokingly saying sorry, although I did not experience this myself. As soon as people started tweeting about Jerry’s little stunt, all the news crews (ABC, ET, Insider, OK, and a bunch of paps) decided to bombard everyone outside of the galleries. Multiple crews were filming segments and asking for interviews. It became a total madhouse! By 3:30 my group and I were at the front of the line! It was also around that time that Jerry ended his pop up “installation”. He came out wearing a paper bag on his head and went down the line of people waiting to get into the room with Shia saying “I’m sorry” to everyone. Around 3:45 is when it was my turn to enter the gallery. Before you go in, the security guard scanned me with a metal detector (for safety measures), and of course, checked my purse. He then whispered to me that I am about to walk into a room with a table and a lady and that once I’m inside she will give me further instructions. At this point, I’d been waiting for 5 hours. My heart was racing and I suddenly became extremely nervous! The guard got the go-ahead from someone over his ear-piece to let the next person in. He opened the door for me and wished me luck. The first room I walked into was pretty large. The only thing in it was a lady standing behind a table that had a bunch of random items. The items included: a whip, a bottle of Jack Daniels, a bowl of Hershey kisses, a bowl full of pieces of paper that had mean tweets about Shia written on them, cologne, pliers, flowers, a copy of The Death-Ray by Daniel Clowes, a ukulele, and an Optimus Prime action figure. The woman behind the table told me to choose an item. Being the chocolate lover that I am, I chose the bowl of Hershey’s kisses. She then told me that she was going to lead me to the room Shia was in and that when I was ready to leave, to go through the black curtain and out the back door. At this point, I’m incredibly nervous. It’s already been an odd experience…I had no idea what to expect when I actually saw him. She led me through two different black velvet curtains and into the room. When I entered, he was wearing the paper bag he had worn to his premiere that read “I AM NOT FAMOUS ANYMORE” and even the same tux! The room was so tiny…like the size of a hallway. He sat very proper and had both of his hands on the table. I immediately felt incredibly timid and uncomfortable. I had absolutely no idea what to do! I awkwardly set the bowl of chocolates on the table and sat down across from him. He stared at me through the paper bag as I said, “Hello”. He gave me no response. I let a little time pass before I asked him if he would take the paper bag off his head. He didn’t answer, and he didn’t move. So I asked him if I could take the paper bag off his head. Before I had a chance to even move my hand, he took the paper bag off and put it on the floor. After that, he just stared at me. Right in the eyes. Like he was peering into my souls. He looked so incredibly sad and had tears welled up in his eyes. It was so hard to stare back at him, to even look at him! Eventually, I started laughing uncontrollably! I have this horrible reflex that makes me laugh when I’m in awkward situations. I immediately apologized and explained that I wasn’t laughing at him. We sat in silence for the next 30 seconds, until I found the silence unbearable. I pushed the bowl of Hershey’s kisses towards him and asked if he wanted a kiss. Once again, no response. I told him that I was going to have one. No response. As I started to unwrap the chocolate, I realized I didn’t really want it at that moment. So, I threw it in my purse. I then asked if I could take a picture of him. He didn’t say no, he didn’t say yes. He didn’t do anything but stare at me in deep sadness. I took out my phone, snapped a picture, and immediately put it away. Again, we sat in silence. He was staring at me and I finally had built up the courage to look him in the eye and stare back. Staring back at him was like looking at a deeply tortured soul. It emotionally affected me way more than I thought it would. It actually brought tears to my eyes and a few even fell out. He began to tear up again as well. We shared this incredibly sad and beautiful moment that felt like it had lasted forever. I told him I felt like I wanted to help him. That I felt bad. That I had no idea what this was all about or why he was doing it, but that I respected it. I told him I thought he was brave. And for a slight moment, he smirked. And then he went back to being sad and distraught. I felt that I had finally gotten the moment I wanted and it was time for me to leave. I told him thank you and I left the room feeling deeply torn. #IAMSORRY wasn’t at all what I thought it would be. I went in with a plan of things to say and do…but once I was in there, I could barely get out any words. I’m not sure how, but it affected me to my core. I felt (and still feel) so moved by the whole experience. The art installation starts at 11 am, ends at 6 pm, and goes till Sunday. If you’re going: bring sunscreen, a hat, and get there super early!! !